My day started at a little after 3:00. AM. 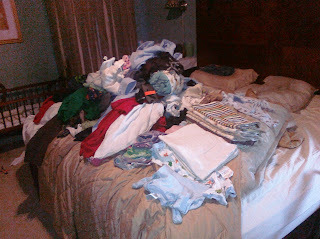 While I snuggled happy baby Aaron in my arms, our toddler (the Gavin-monster) burst through the bedroom door. Wide. Awake. I tip-toed back to bed, slipped under the covers, snuggled up with Aaron and then 20 minutes later, he was back! I gave up and let him get in bed with us, where he proceeded to talk loudly, poke William ("daddy - you asleep?") and kick me in the back. After about 10 minutes of hoping against the obvious that he would magically fall asleep, I got up with both Gavin and Aaron so William could sleep. It was 4:20 AM! I fixed 2 waffles and a glass of Vanilla Soy Milk and settled into the living room for North and South, a BBC drama on Netflix. At 6:00 I made macaroni and cheese, by special request. At 7:45 he excitedly proclaimed "the sunshine's up!" right before he pitched a terrific fit that daddy was leaving for work. At 8:00 I dosed him with benedryl and put him down for "nap". Fortunately we had received 2 educational DVDs from Netflix, so I decided that would suffice for school today. We watched a science video on cloning, then I caved to the craving for Sonic Happy Hour. When we returned home, the mail had arrived, bringing a Chasing Fireflies catalog. Now, Jordan and I love this company - they have so many fantastic things! If I ever loose my sanity and gain a fortune, I'll order one of them. There are a few styles in particular that she really likes, so I had her cut them out and make a collage. We are going to use it as inspiration for her next dress. Notice I didn't say "Easter Dress" - I'm not making any promises! Calvin had been busy with Legos in his room, he came in and announced that he had completed his Architecture lesson! He made a house, table and bench. He wanted to make a soda fountain for his Star Wars Lego men, but ran out of pieces. When he saw that Jordan had an art project, he wanted one too. I asked him what kind he wanted to do, and he went and got the Paper Making kit. With a little help from this Papermaking Recipe, we made several, umm... sheets? Calvin decided to go free-form! Now Jordan is making paper, chicken nuggets are in the oven, and I've got to be at the church in 45 minutes to meet someone to pick up the garage sale leftovers. Then a rush back home to make a Finance Committee Meeting with my very own "free-spirit" financier. We're going through Dave Ramsey's "Financial Peace University" with our church. 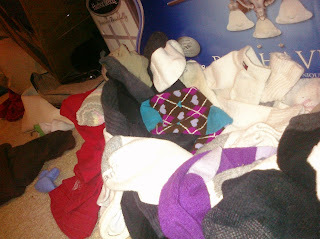 In an unprecedented unilateral move, the Giger Laundry Authority virtually eliminated the sock population. When asked to explain her actions, Mrs. Giger declined to comment on the record. It is rumored that the home executive was teetering on the brink of collapse from what the source referred to as "laundry overload". Sources tell us that Mrs. Giger was spotted at a local discount store purchasing replacement socks for the entire family. The only socks that seem to have escaped her wrath are the the recently added baby socks, even though they have huge potential for becoming mismatched. Mismatched socks are the leading cause of "laundry overload", followed closely by finding still-folded clothes in the laundry pile. As you can see in these exclusive photos, the Laundry Authority has been operating at maximum capacity. Sources tell us that clean folded laundry often sits unattended for days or weeks at a time. 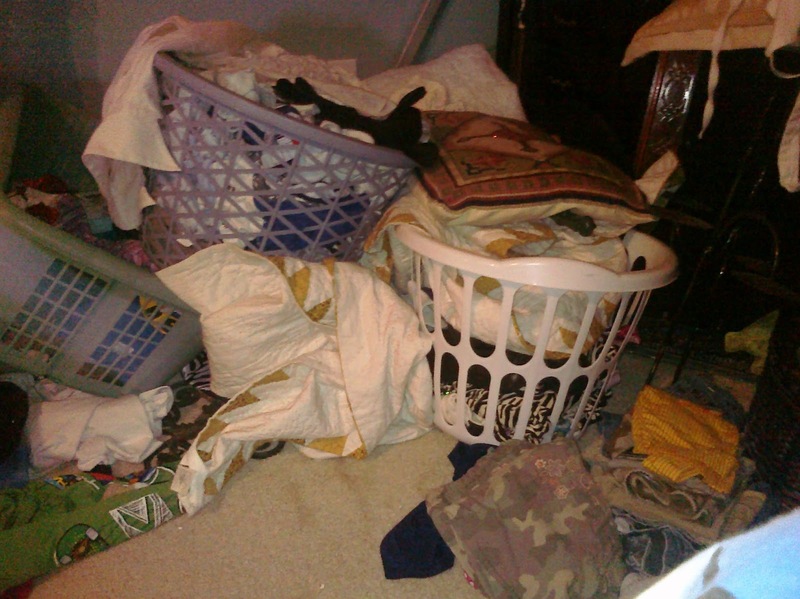 This mountain of clean laundry is rivaled only by the tower of still-to-be-washed laundry. When asked to comment on the carnage, Mr. Giger only replied "I plead the fifth." Our insiders have lead us to believe that this is due, in part, to his contribution to the problem. College roommates confirm that "back in the day" Mr. Giger was fond of shopping, rather than washing his dirty clothes. Given his proclivity for mens fashion, this trend may have continued into his married life. He has been seen recently with socks ranging in hues from light tan to deep brown, in addition to the standard black, grey and navy. These socks were also patterned, each differentiated only enough to drive a sock-matching person to wits' end. In an odd twist of fate, these maddening socks were spared the wrath. 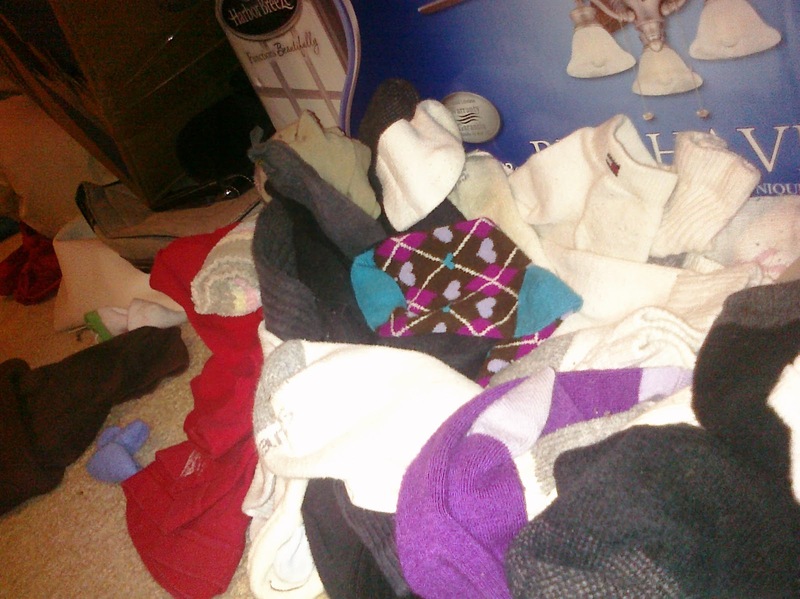 Here, socks huddle together, hoping to survive the decimation. Daylight would show that their hopes were in vain. Another major contributor to the sock population is the only daughter. She is on record as being a fashionista, previously requiring socks to match each outfit. She is currently recovering from this addiction at an undisclosed location. Her publicist released this statement: "Ms. Giger is fully aware of the consequences of her actions. She has accepted the fact that she will now be required to wear only white socks with the label in purple. 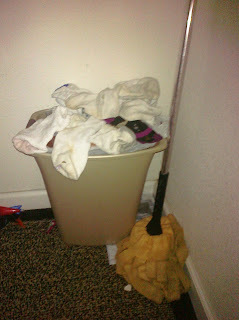 Ms. Giger also has reserved the right to increase her sock wardrobe when she is living on her own and/or fully in charge of her own Laundry Authority." The oldest son is somewhat innocent, owing to the fact that his socks become worn out so quickly that they have already met their demise. The toddler was a minor contributor. He was recently spotted with matching white socks on each hand proclaiming himself to be "Mickey Mouse". We were unable to reach The Magic Kingdom for confirmation. 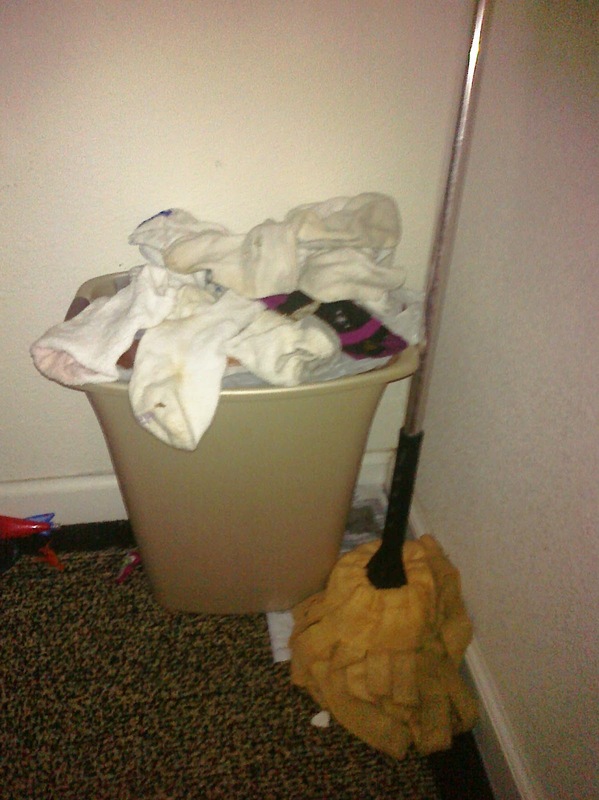 Mrs. Giger's own socks fell victim to the clean-sweep. They were so aged they barely stood a chance.